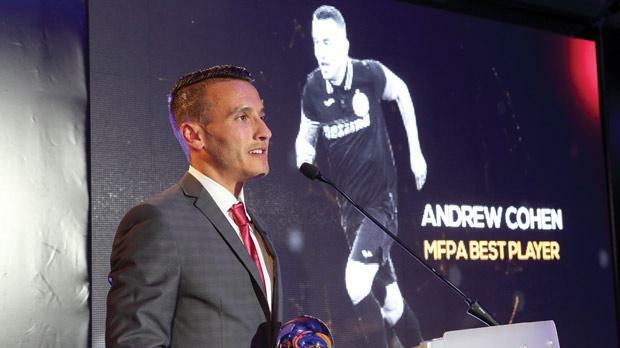 Hibernians captain Andrew Cohen has claimed the top prize at the 2014/15 Malta Football Players Association (MFPA) awards, held at the Hilton Malta earlier this week. A host of distinguished guests were present for the presentation ceremony as Cohen won the main award on the night ahead of team-mates Luis Edison Dos Santos (now playing in South Korea) and Jorginho. Gilmar, of Naxxar Lions, was the other contender. Members of the players’ union took part in the poll. An emotional Cohen received his award from former Malta captain Gilbert Agius. Newly-crowned champions Hibs had good reason to celebrate as Branko Nisevic was named best coach of the season and six of their players – goalkeeper Henry Bonello, Clayton Failla, Rodolfo Soares, Andrei Agius, Cohen and Dos Santos – were named in the team of the year. The young player of the year award went to Valletta’s Gambian midfielder Hamza Barry and in new categories introduced this year, Argentine Ariel Laudisi, of Pembroke Athleta, was named top player in Division One and Alan Mario Sant the best referee. Meanwhile, special recognition was afforded toFr Hilary Tagliaferro, considered by many as the founder of local football nurseries. Fr Hilary is synonymous with the game in Malta and his contribution knows no bounds, having also carried out duties as sports journalist and Youth FA official for several years. Fr Hilary thanked the organisers for the Merit Award and took the opportunity to remind the audience that the proposed increase in the number of foreigners in the Maltese league could have a negative impact on the development of young homegrown players. In his address, MFPA secretary general Carlo Mamo highlighted the achievements of his organisation over the past few years. He also outlined the MFPA plans for the future and thanked the executive committee, members, club delegates and sponsors for their contribution during the season. “In particular, we would like to show our appreciation to those who contributed to the Player Status reform,” he said, “but we don’t fully agree with the increase of foreign players in our competition. “In our opinion the national team stands to suffer if there a more overseas players in the Premier League. Henry Bonello (Hibs); Zach Muscat (Birkirkara), Clayton Failla (Hibs), Nikola Vukanac (Birkirkara), Rodolfo Soares (Hibernians), Andrei Agius (Hibs); Paul Fenech (Birkirkara), Andrew Cohen (Hibs), Gilmar Da Silva Ribeiro (Naxxar); Bojan Kaljevic (Balzan), Edison Dos Santos (Hibs).